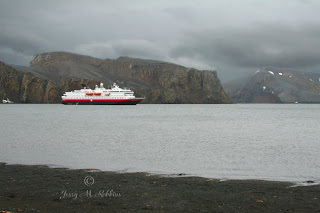 Whaler's Bay at Deception Island was our first landing on our Antarctica cruise. 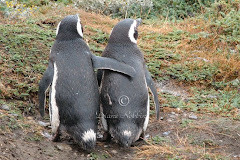 The island was once active as a whaling station. 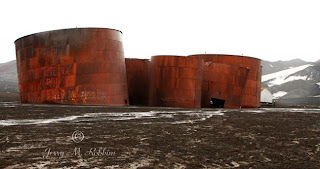 Now, bare and ugly, it is the home to old rusted tanks that once held the whale oil, and in the area we visited, a few penguins and seals. 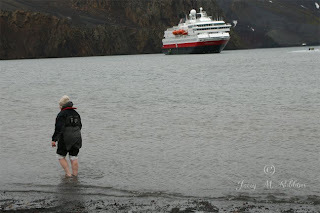 We anchored in the now waterfilled caldera. Entrance to the caldera is through a very narrow channel called Neptunes Bellows. It was neat being on deck, watching as the Captain maneuvered the ship through this narrow area. Heat is still rising into the water. Technically, it is a 'restless caldera with a significant volcanic risk'. It was the only place on our cruise where we would really be able to get into the water. Several people came ashore wearing bathing suits under their heavier clothing. I wasn't that brave and just waded in. The shallow water along the shoreline was HOT! Almost too hot to stand in. As I waded deeper, the water got cold, then COLD! What a neat experience.